Home » Growing » Potting Soil! 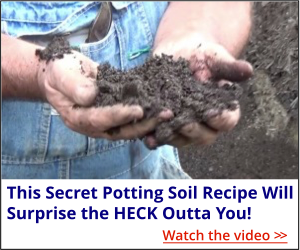 What can I use to make my own potting soil. Potting Soil! What can I use to make my own potting soil. The important points about a Good Potting Soil Mix. 1. First of all, it is confusing because there are so many options that make for a good mix. A lot of it has to do with what is available to you in your area. 2. Pea gravel. I used to add pea gravel to my well rotted hardwood bark mulch but I’ve learned that adding pine bark is really a better option. In small quantities pine bark is often sold by the bag and called soil conditioner in the box stores. 3. Rotted hardwood bark mulch is still a good option, I used it for years with great success. It only failed me when I tried to really stock up (50 yards worth) then it rotted too much and didn’t drain well. That’s when I started mixing in large amounts of pine bark. 4. Growers actually use pine bark fresh because even as it ages it really doesn’t change a lot. 5. So right now my ideal mix is very heavy in pine bark and to that I add either commercial compost or well rotted hardwood bark mulch. 6. But what I really do is buy a load (90 yards) of pine bark then I start working that into the potting mix that we are current using. I think it’s important for me to stay ahead of the wave by adding more pine bark before I am out of soil. Right now I have a large pile of pine bark that’s been sitting here since ???? early summer I think. And there is a part of my potting soil pile that is far too aged and compacted so on my to do list is to blend these two piles together before spring. 7. Yes, I now have a front end loader that makes this easy. But at this place, https://mikesbackyardnursery.com/2016/03/mikes-first-backyard-nursery/, I used a shovel, a wheelbarrow and a rototiller. I usually kept about 10 yards on hand and always replenished my pile before it ran out using the old to mix with the new. 8. But back then I never turned the entire pile. That would have been crazy. I’m too lazy to turn compost! Or as I like to think of it, I value my time more than that. 9. Instead when I added fresh material, bark mulch, commercial compost or pea gravel to my pile, I simply put it on top. I’d use a two by twelve as a ramp to get the wheelbarrow up on top of the pile. I built the pile like a “Dagwood Sandwich”, you might have to Google that. Layers of materials. Then when I needed soil I would simply rototill one corner and get an awesome mix that I’d shovel on to the bench by hand. 11. So yeah, today I do things very differently, but I started exactly where all of you are today. Fergus learning all about pine bark mulch. No matter what you use, it doesn’t have to be my mix, just pick a potting soil that somebody else here is using with great success. Bagged soil? Sure if that’s what you want to do. I have no idea how much it costs to fill a one gallon with a bagged mix but I am curious about that if anybody wants to share than number with us. Looking online for mulch is probably not the best place to look because many of the dealers who sell mulch really have little to no web presence at all. I’m sure there has to be some hardwood bark available in New Jersey. I’d pick up the phone and start calling around. Garden Centers, landscapers and excavators will know who sells bulk hardwood bark mulch. These dealers are often hidden away on some side street. I’d take a full day and visit as many garden centers and nurseries in your area that you can. Browse, ask some casual questions. 1. Do you know of anybody in the area that sells bulk mulch. 2. Do you know of anybody in the area that sells bulk potting soil. 3. What do most growers around here use as a potting mix. Bulk potting soil is available, usually around $55 a yard, but worth it. But it’s not readily available in all areas and in most cases you need to send a truck to get it. But it won’t cost anything to ask these questions. You’ll either get really good, answers, might get the brush off, or you might find somebody who loves to talk about growing plants and will bury you in valuable information. Questions, comments, mean things to say? Post them below and I will respond appropriately. This is my first time to post a comment/question on your site. I have a potted Japanese Maple, four or five years old. I noticed lately that it looks like something is stripping the bark from it in two places. I would post a picture, but I don’t see where that is possible, as far as I could tell. I read that squirrels sometimes strip bark to build their nests. Any ideas? I live in Louisiana, zone 8b. It’s difficult to say but I do know that during the winter I’ve had mice destroy Japanese maples by eating the bark from the tree. So squirrels may like them as well. Just trim up the ragged edges and put a tree guard on the tree. I wonder how do you store your unsold potted perennials in the winter?. Do you leave them setting on top of the ground or do bury the pots down in the garden soil for root protection? Perennials don’t over winter well in pots uncovered. Covered under white plastic they do better. https://mikesbackyardnursery.com/2013/11/over-wintering-protecting-plants-for-the-winter/, or pop them out of the containers and heel them in your garden until spring. Or discount them in late fall and sell them off. Some things do better than others. Is Cedar bark ( that is broken down ) good to mix in the potting soil? I would say yes, but I can’t say that for sure. Ask garden centers and nurseries around you what’s in their potting mix. A word about pH levels if you use something as acidic as pine bark. What is the pH level of the potting mix with pine bark as compared to the commercial stuff? I’ve never tested the ph of my potting soil. My plants thrive, that’s all I need to know. I do pretty well and I don’t over think things or get all caught up in details. I’d love a Japenese Maple but don’t have a speacial place.for one. We have bad winds at times so I substituded it for a newer Elderbarry that people think is a Japanese Maple. I’m in Zone 6 but have a daughter who lives in Zone 4 buthas an ideal courtyard that can also be protected in the winter and I am thinking of just giving it a try. She wants one so badly. I’d pick a zone 5 and give it a go at it.???? Love your letters I can’t tell you how many people I’ve given the letter of “So You Are Addicted To Gardening”. People love it. Especially gardeners. Yes, I’d give the Japanese maple a try. Life is too short not to. I know nothing about this grass, wish I could offer more help on this. Re Shredded bark. So far I haven’t found a place in Long island that sells shredded pine bark. Nuggets, yes, but not shredded.. My small plot does not make it worthwhile to have it shipped from somewhere. Instead I’ve mixed compost, coir, turface, perlite, and regular potting mix for my figs and other potted plants. Many potting mix recipes are calling for shredded pine bark but it’s nearly impossible to find here. Stores often sell soil conditioner. Check the bags, it’s usually pine fines which would be perfect. If not, you simply have to improvise using hardwood bark mulch. I grew in rotted bark mulch for years. I get 4-6 yards a couple times a year from a local tree trimmer. It’s mostly shredded oak. I’m happy for the mulch/compost. He’s happy to avoid the extra driving and tipping fee at the local dump. I save him about $90+time. He saves me $30-$50 on mulch. That’s okay for mulch but not for use in a potting mix. Way too much wood for a potting mix. Love your videos, Mike. Looks like pine bark does double-duty as soil amendment and donkey food. They are curious creatures, aren’t they? Thanks for all the useful Horticultural advice. Great tips, Mike! I learn so much from you. These videos are great! And this one….!!! I just laughed the whole time you’re talking with those donkeys nosing in the bucket of pine bark!! LOL!! Have to go back and just listen while I work in the kitchen so I don’t see those hilarious donkeys!! That’s the only way I’m gonna hear what you said. HA!!!! Thanks for ALL your valuable gardening help!! Would Austrian pine needles be good to add to potting soil mix. Can they also be used to deter cats from raised beds? I would say not. I don’t’ think they would add a thing of value to potting soil and they take a long time to decompose. You talk about potting soil. I have that nasty sticky clay in my veggie garden. Put leaves in and rototiller once in awhile to try to get it easier to work with. What would you suggest I do with the clay soil? My veggie garden is 50 x 100 feet. Have made it smaller the last few years by putting raspberries at each end , I use a lot of space with cucumbers , cantaloupe and watermelon.., so it takes a lot of space. Thank goodness for Preen. Just keep tilling in more organic matter, the soil will improve and loosen. Instead of tilling organic matter into your garden, you could try simply layering it on top. Compost works great for this, but also lawn clippings, straw, etc. Every time we till the soil, we are disturbing the millions of living things in the soil – from earthworms to beneficial fungi all the way down to microscopic bacteria and protzoa. This ‘Soil Food Web’ works to break down organic matter and also minerals in the soil, making nutrients available to plants. These organisms form partnerships with plants to help keep them healthy, to keep disease and hamrful insects away, and to keep the soil light and airy for the plant roots. If you wanted, you could try it in once area of your garden and see how it goes. The Soil Food Web will build your soil downwards into the clay as you build it in top by adding organic matter. Clay can be difficult, but it holds nutrients well! I have pine needles from my Austrian pine trees. Would this be a good raised bed cover to keep cats out of the beds or as a mulch? As a mulch it could work, pine needles are often use to mulch with. Speaking of things hard to find; i LIVE IN INDIANAPOLIS and AJUGA plants are rare as hen’s teeth. SUPPOSEDLY THEY COME IN many colors; I’d like anything OTHER than chocolate chip. GOOD SOURCES??? If you are a member, http://backyardgrowers.com/join, I’m sure the members have different varieties, I see them in the buy/sell area often.